This Kaleidoscope inflatable spider lights up so your trick-or-treaters can see it better on your lawn. This nine foot long spider wears a stylish tophat. 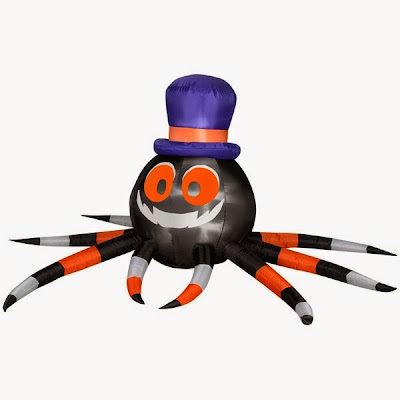 This orange and black spider looks like she's ready to gobble up some trick-or-treaters! She also comes in green and black. Which color set do you find more frightening? Some people might find the look on this inflatable archway spider's face goofy, but I find it quite menacing! The exaggerated legs on this archway spider are a bit silly, but then again, this thing is nine feet tall! This inflatable skull has neon spiders crawling all over it! 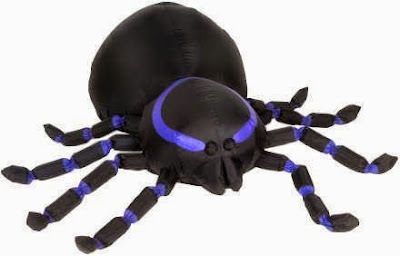 This four foot inflatable spider is for indoor use only.